The recent critical and Oscar success of Michel Hazanivicius’s The Artist has gotten people talking about silent movies again, even if, perhaps, it hasn’t got them watching any. 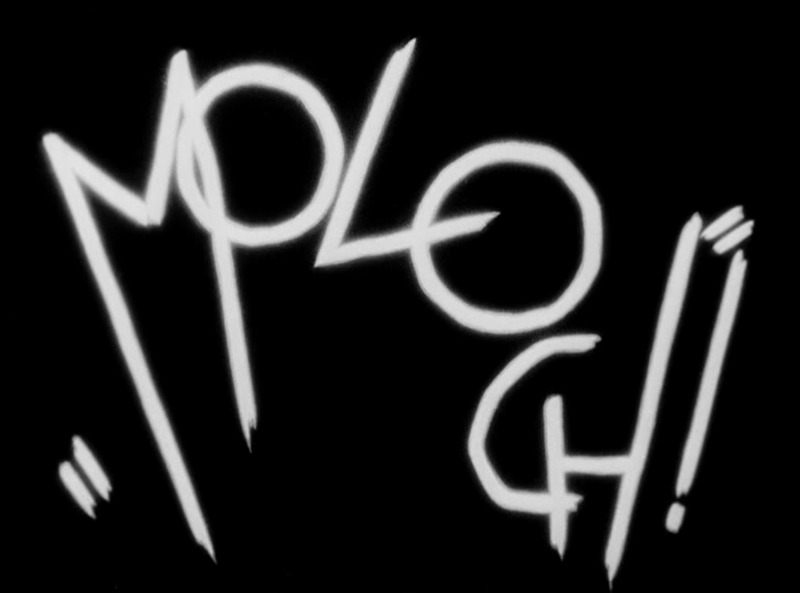 Watching The Artist and other silent movies lately, I have developed a fascination with the intertitle, the styles different filmmakers preferred and how they can be used. Intertitles don’t just fill in the gaps in dialogue, but often in atmosphere. While nowadays a film set in ancient Rome will likely say “Rome 89AD” on the screen near the beginning (proof the intertitle still lives on in some form), traditional intertitles will give us descriptions of sounds, sights (multiple shot set-ups and edits were less readily available in the ’20s) to help us settle into the setting, just as a storyteller will give us seemingly unnecessary details that help conjure up worlds in our imaginations. Nowadays that manner of storytelling is only available if you have Morgan Freeman to narrate your film, and even then it still feels dated (Million Dollar Baby is a prime example). This list is in no way definitive; I am no expert in silent cinema and these are just my favourites of the intertitles I have come across. I hope yet to come across many more. F.W. 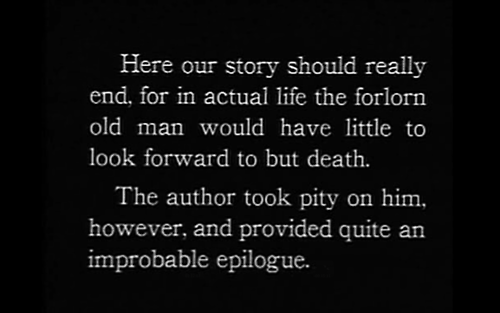 Murnau’s The Last Laugh is perhaps most famous for having one single intertitle. But what an intertitle! After telling the depressing story of an elderly hotel doorman (Emil Jannings) demoted to washroom attendant and then scorned by his friends and family, the film does an about face and gives him a happy ending. The intertitle descends from on high and brings our hero good fortune – a wealthy relative dies and leaves the hero all his money. It’s all a bit meta really, isn’t it? Perhaps the crowning achievement of Charlie Chaplin’s career, City Lights is one of those romantic comedies where the guy does everything to win the girl, and only succeeds at the last minute. Chaplin’s Tramp falls for blind flower girl Virginia Cherrill, who mistakenly takes him for a wealthy man. He manages to get her the money she needs for an operation to restore her sight, but when they finally meet, she does not recognise him. In the style of a fairytale romance, it is only when she touches his hand that she realises this down-and-out is the man who changed her life. 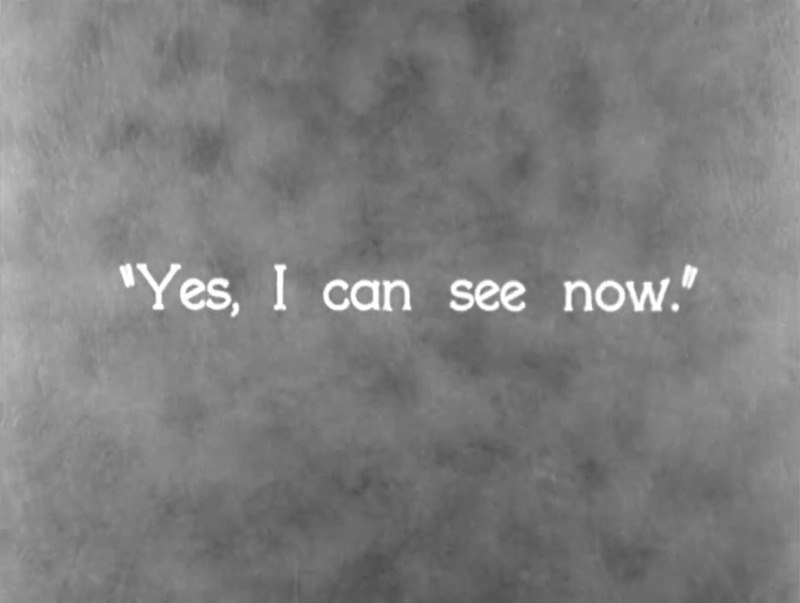 “You can see now?” he asks her, and she smiles back and says “Yes, I can see now.” It is the final intertitle of the film. 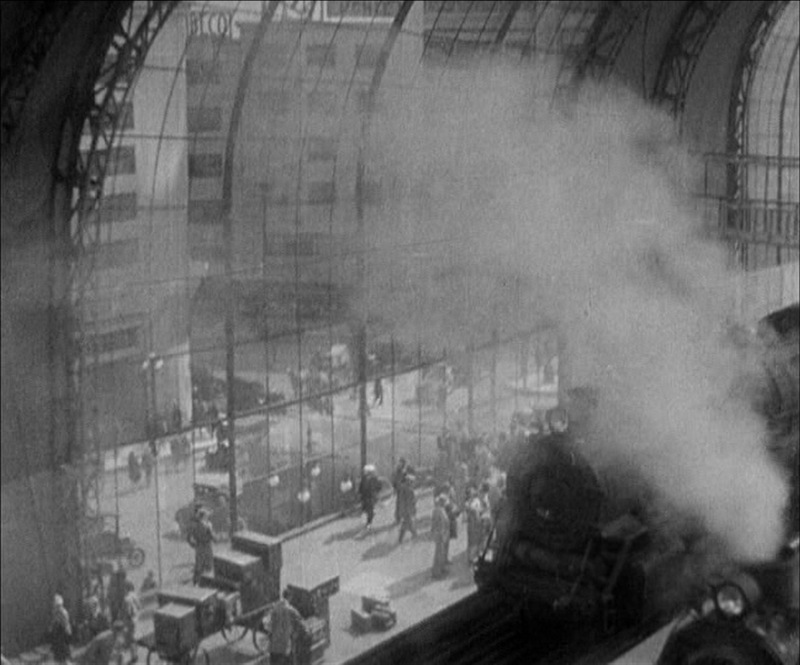 City Lights was made three years after the talkies had become popular, but Chaplin insisted on keeping the Tramp a silent character in a silent world. The movies, after all, are something that we can all see now. Sound can always wait. ation you may ever see. 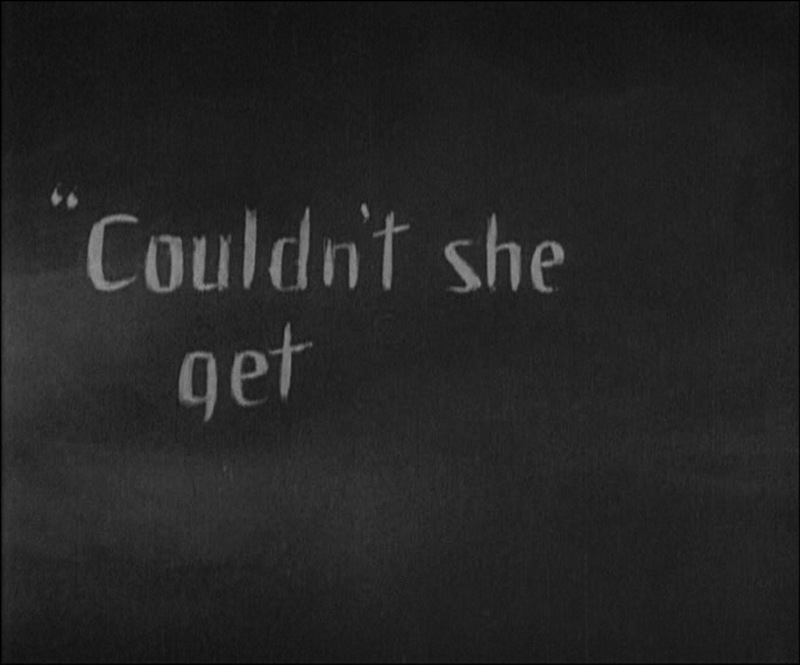 The Artist was a wonderful achievement, but for me nothing sums that up so well as this intertitle. It comes as our hero, washed-up silent movie star George Valentin (Jean Dujardin), despairs at the death of his career and the mistaken belief that the girl he loves, Peppy Miller (Bérénice Bejo), is interested in him only as a trophy from a bygone era. As he raises a gun to his mouth, Peppy races recklessly in her car to find him. As the film’s score dies down George, sweating with terror, bites down on the barrel of the gun and BANG! – Peppy crashes into a tree outside. This audio-visual pun on the two sounds (and yes, there’s a pun in audio-visual there) is perfectly timed and handled. 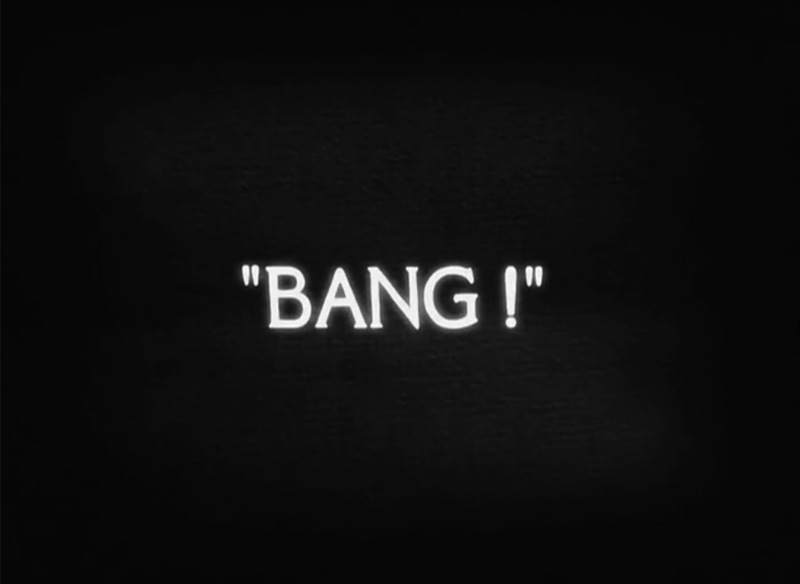 The crash, and by extension the intertitle, interrupt George’s suicide and thus save his life. 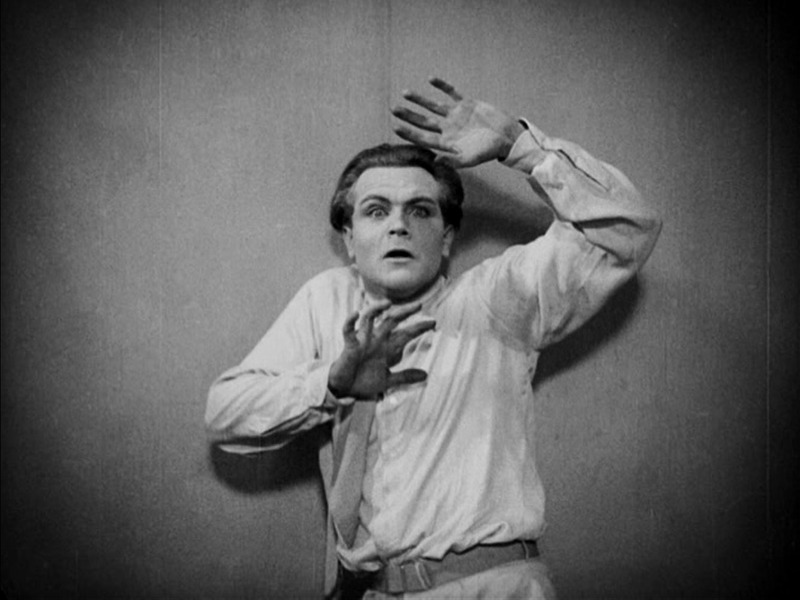 Similarly, the audience, close to seeing their hero make such a grave and irreversible error, have the tension relieved with a wonderful gag that makes full use of the film’s potential as a silent movie. It is a gag worthy of Chaplin himself. Another entry for Murnau, and one of the most famous silent dramas of all, Sunrise is a remarkable genre mashup, infusing romantic drama, thriller and comedy sequences into one incredible tale of 24hrs in the life of a rather ordinary couple. 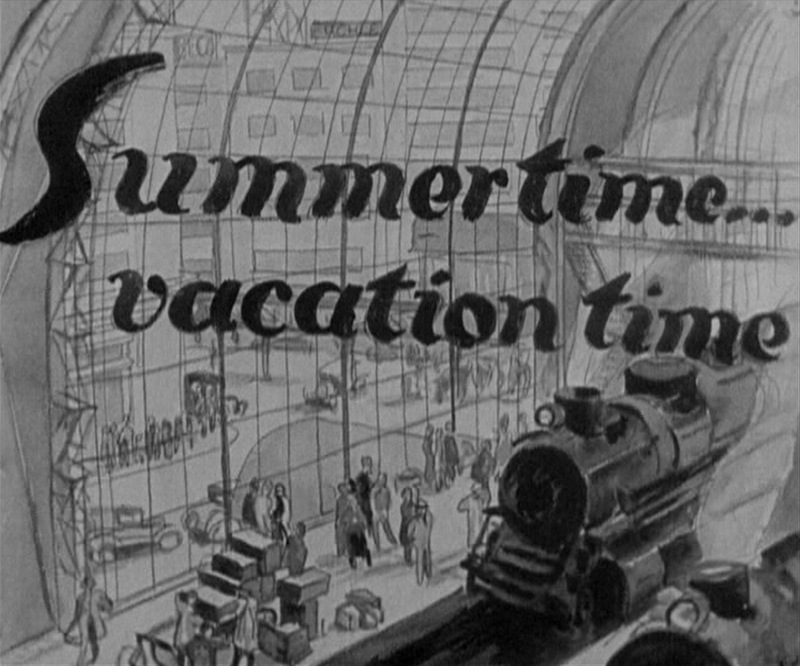 The film opens with a montage to set the scene, letting us know that it is “Summertime… vacation time”. But it’s not just the gorgeously illustrated intertitle that makes this a top pick, but how it dissolves into the shot, and indeed the film, that follows. Sunrise has plenty more delights in store, including one superbly animated intertitle. In the film, a man from the countryside (George O’Brien) is having an affair with a woman visiting from the city (Margaret Livingston). 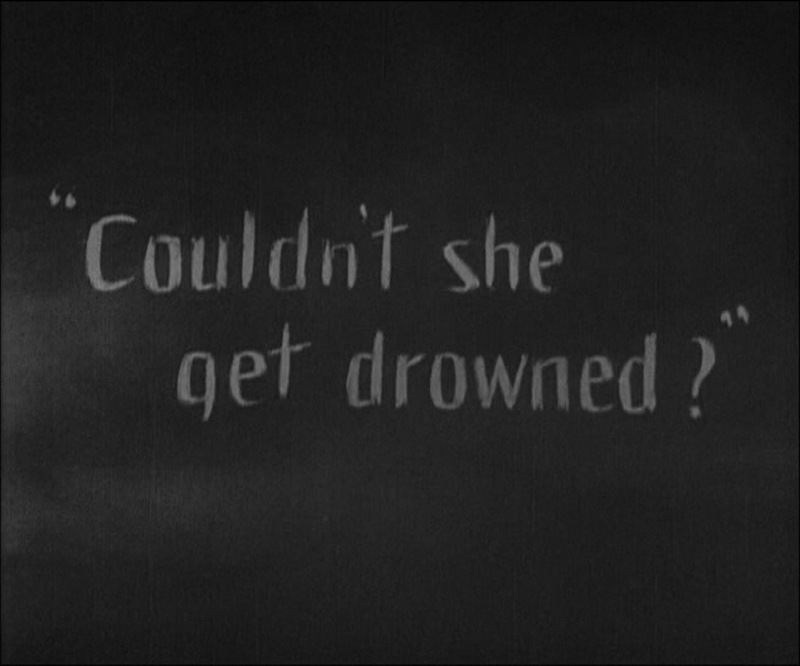 When he asks how they can be together, she suggests they dispose of his wife (Janet Gaynor), saying: “Couldn’t she get… drowned.” But rather than use an ellipsis or second intertitle, the word drowned materialises on the intertitle after a delay, moments before the entire sentence melts away, or drowns, to expose the wickedness of her suggestion. 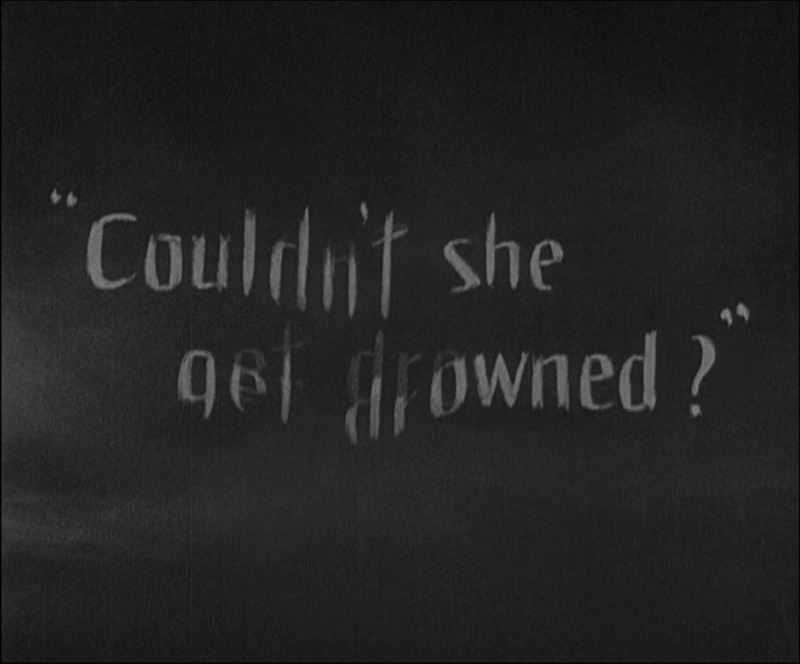 The intertitle then dissolves into a fantasy of the man throwing his wife off a boat. You can see the whole spectacular sequence here. 5. 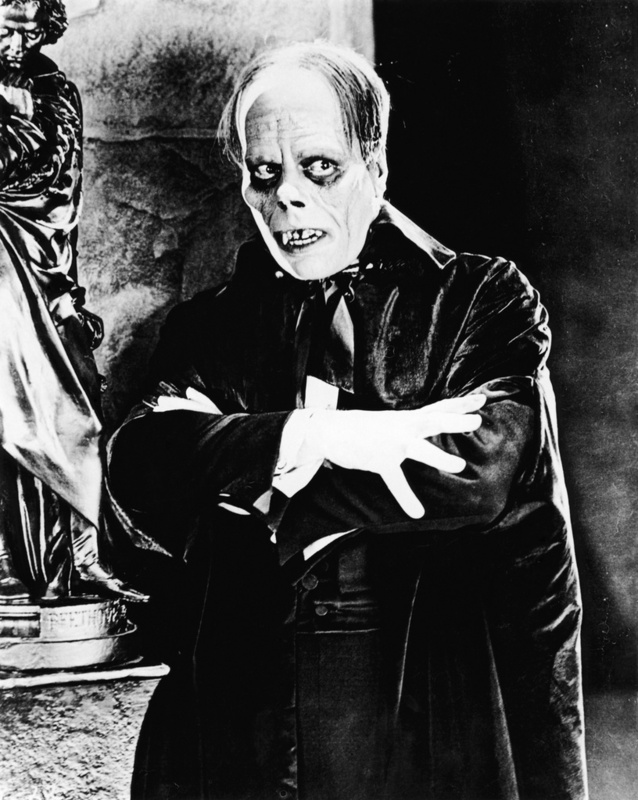 The Phantom of the Opera (1925) – Remember when people talked like this? This one really speaks for itself. The Phantom (Lon Chaney) reveals himself as a creature too hideous to post in this article (click here, if you dare! ), and then utters this delicious line. I struggle to deal with the fact that nowadays a movie villain could not deliver a line like this without descending into high camp. Alas, I don’t think we’ll ever get the chance to hear this sort of scenery-chewing genius again. Somehow, I blame Aaron Sorkin. 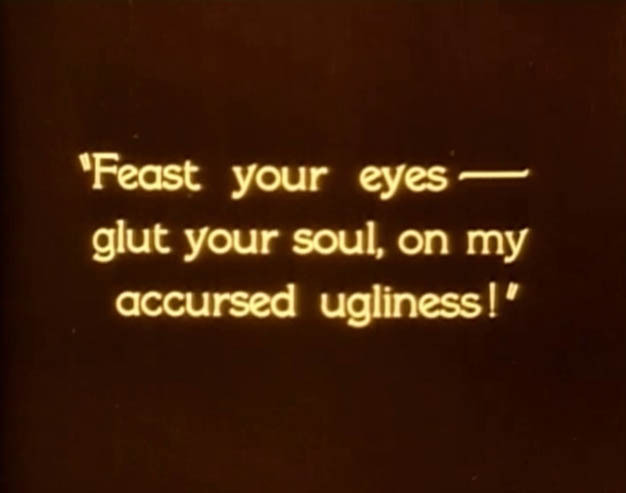 Surely the most famous intertitle in all of silent cinema history. 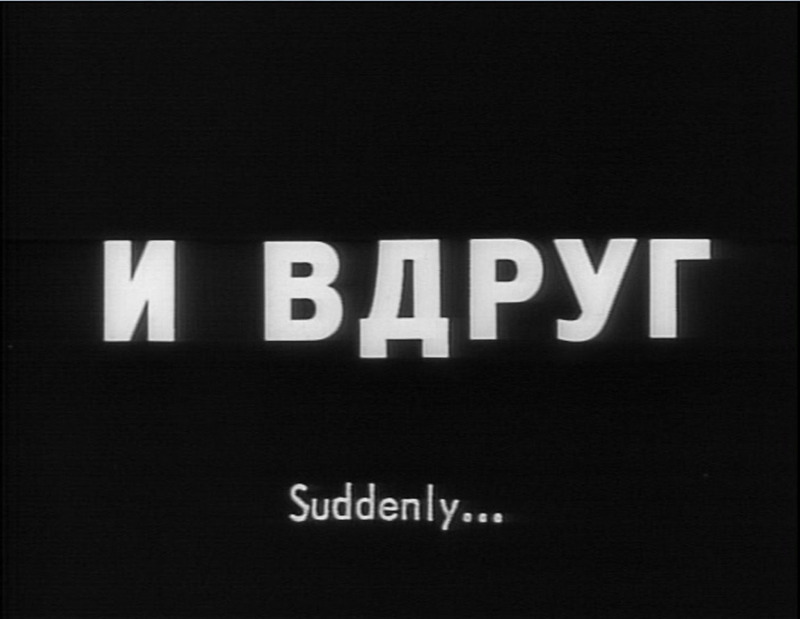 The “Suddenly…” that unleashes the forces of the Tsar on the citizens celebrating on the Odessa Steps is the definitive intertitle. It literally breaks apart two sequences with incomparable moods: beforehand high spirits and high jinx after the rebelling sailors seize control of the Potemkin; after, a screaming, hectic, bloody slaughter. Too many words have been written about Eisenstein’s immaculate filmmaking and the carnage that follows. I can only let it speak for itself. Murnau (again) directed his version of the 19th Century German legend in 1926; his last film before leaving for Hollywood to make Sunrise. An alternative take on the story of Job, Faust is about a man led astray by the devil, in the guise of the demon Mephisto (a wonderfully over-the-top Emil Jannings). Faust (Gösta Ekman) falls victim to Mephisto after the demon bets an Archangel (Werner Fuetterer) that he can destroy all the good in a man. In the end, it seems Mephisto has succeeded. Faust is made miserable by the Devil’s plans and in the end throws himself on a pyre to burn with his beloved. But as Mephisto claims victory, the Archangel tells him he has in fact lost the bet, because of the power of one word. 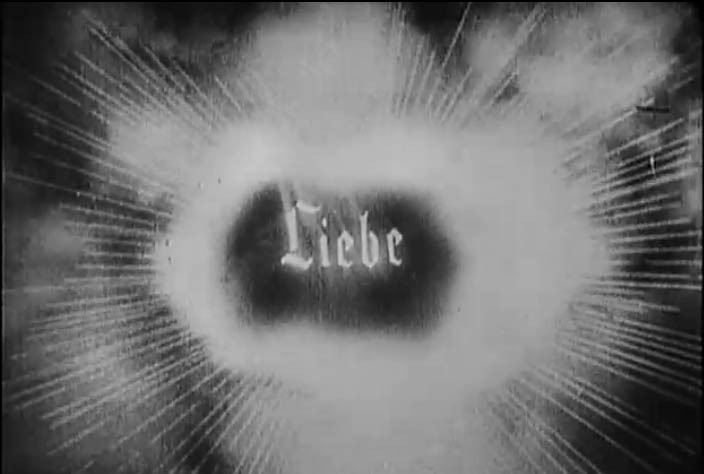 Mephisto demands to know the word, and in a fit of light worthy of the Stargate in 2001: A Space Odyssey, the word “Liebe”, or “Love”, flies straight at the screen, practically punching the audience in the face with its glory! The Devil learns never again to mess with a guy armed with a lightning-shooting sword and love. Two summers ago I saw Faust at an outdoor screening, with a live score provided by the endlessly talented 3epkano. It was after midnight when the film drew to its close, and the audience was inebriated on any number of substances. But when that Liebe hit the screen, a cheer rose up from the hundreds present that could have scared away the Devil himself. Never doubt the power of the intertitle! 2. 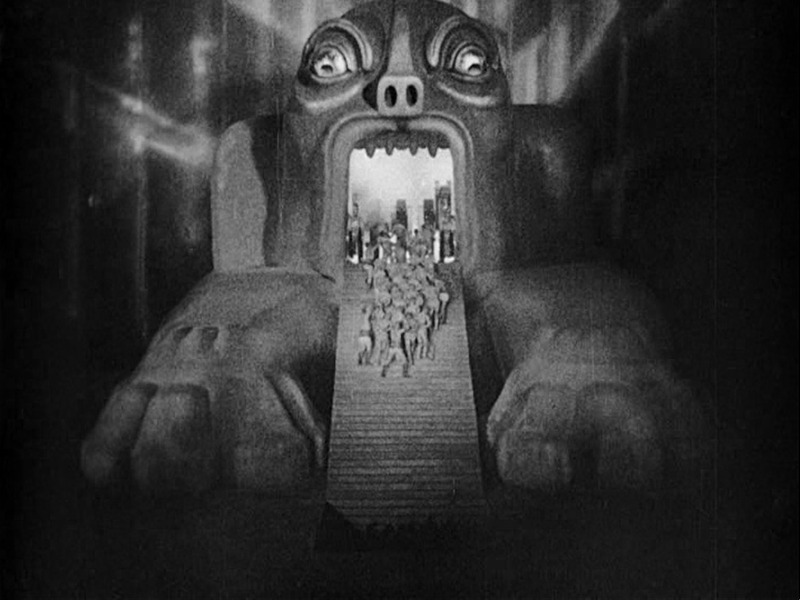 Metropolis (1927) – Holy shitsnacks it’s Moloch! Look at that! I mean really look at it. Is that the best word you’ve ever seen written down? What font is that? Times New AWESOME?! Would it make it better if I told you that the letters making up the word “Moloch” assemble themselves by rocketing in from different sides of the screen? Oh, it would, would it? Well they do. So here’s the story. Joh Fredersen (Alfred Abel) is the pampered son of the ruler of Metropolis, a massive, futuristic city. After seeing a beautiful girl, Maria (Brigitte Helm), he ventures into the city’s underworld where she works in one of several power stations that keep the city above running (it’s all about class, don’t you know). Joh is impressed when he sees a massive machine in operation, but moments later it overloads and begins exploding the men who work on it. Joh is suitably horrified. To add to his horror, he takes this moment to have a fantasy in which the machine is Moloch, a pagan god from the Old Testament to which children were regularly sacrificed. The machine morphs (through brilliantly handled double exposure) into a fire-breathing monstrosity, chowing down on slaves (workers, get it?). Cue that remarkable intertitle. To be honest, I’m not sure one exclamation mark will quite do. Now that every character in modern cinema from Sam Gamgee to Darth Vader has ruined the screaming of the “Noooo!”, maybe it’s time we went back to the screamed intertitle. No? Fine then. Actually, I know I’ve posted this link before, but this scene really needs to be seen to be believed. Enjoy! 1. 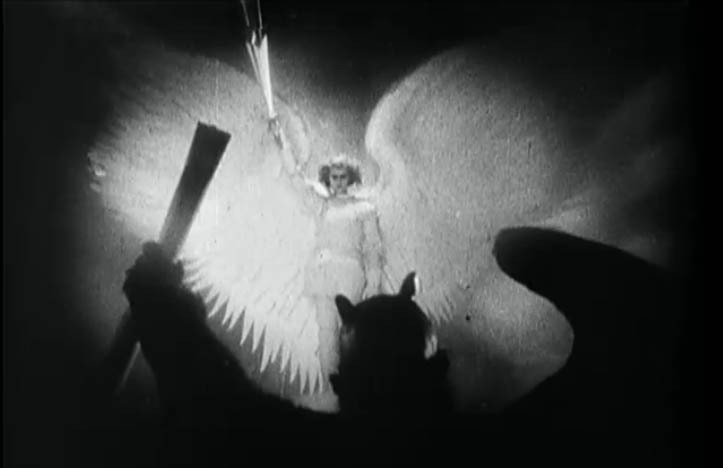 Nosferatu (1922) – Best. 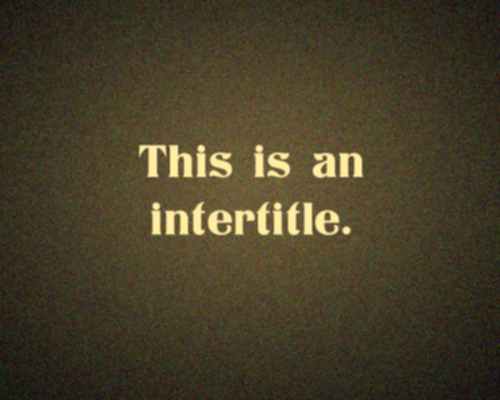 Intertitle. Ever. Nosferatu’s full title is Nosferatu, eine Symphonie des Grauens, or Nosferatu: A Symphony of Horror, putting it in the running for best subtitle ever, also. But this example here is the spirit of all intertitling. Let me set the scene. Dracula, that is to say his non-union German equivalent Count Orlok (Max Schreck), has fallen in love with Ellen Hutter (Greta Schröder), the wife of his real-estate agent. An aged, monstrous vampire, with a lethal allergy to Vitamin D, he attempts to reach her by shipping himself from Transylvania to Germany in a coffin full of dirt (a similar trick is later used in the film Three Colours: White). One by one the sailors on the ship fall victim to a terrible plague, brought by the rat servants of Orlok. When only the captain is still alive he chains himself to the wheel determined to make it to port. But Orlok has other ideas. This isn’t exposition. 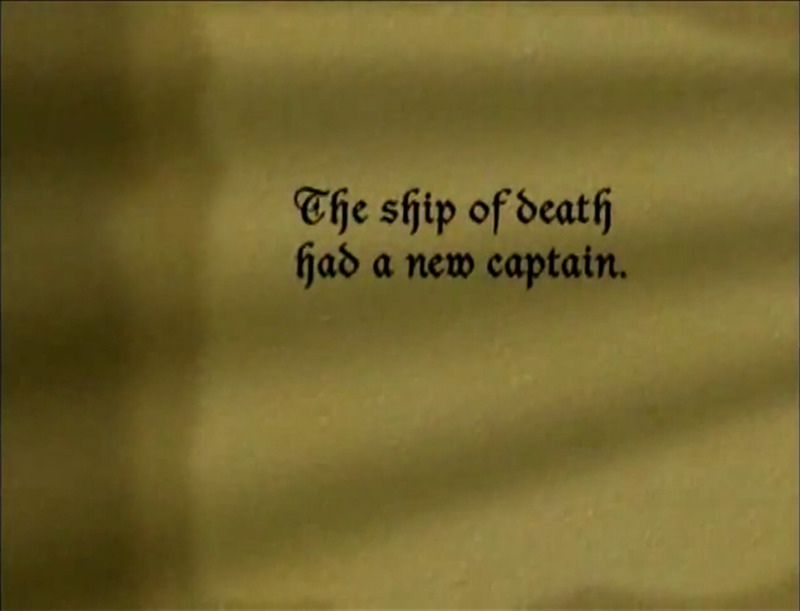 We know it had a new captain, because we just saw the captain die. This is literature. It is dramatic. It is punchy. If it were the last line in a chapter of a book, you would forego eating and sleeping until you read the next chapter. It is the purest demonstration of something that intertitles can do that voice-over narration simply can’t, and that is to romanticise the language which is being used. Morgan Freeman could say those words, but like the ending of War of the Worlds, they could only come out corny. The intertitle disrupts the film to bring you breaking editorialising. An amazing piece of storytelling that cinema has sadly lost. As a final note, I should point out that not all prints of Nosferatu (and given it’s in the public domain, there are many) use this translation. This version, for example, uses the slightly less punchy “Driven by the fatal breath of the vampire, the vessel moved rapidly towards the Baltic.” Although, in fairness, that’s pretty cool as well. You had some pretty good choices on your list. My favorites on your list are from Faust and City Lights. 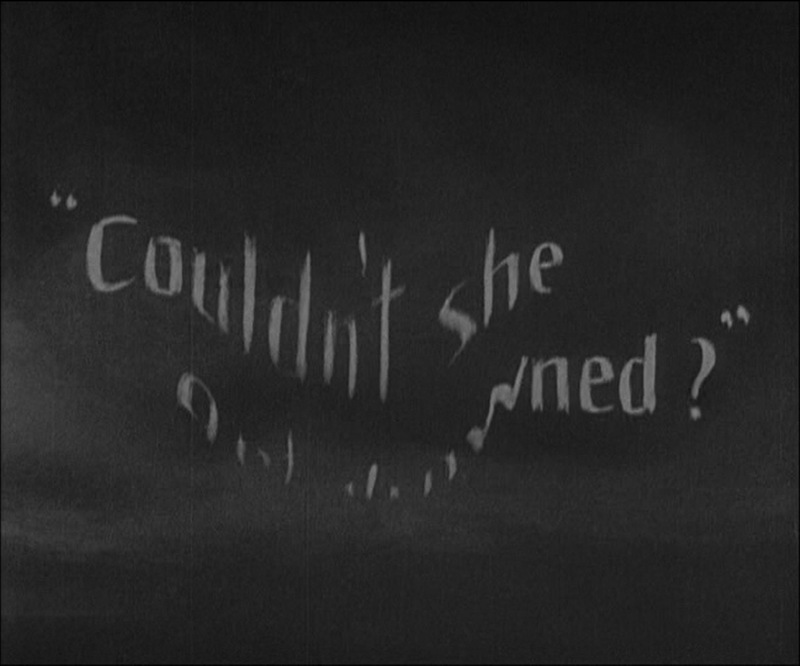 Another intertitle I’ve always liked (even though the film isn’t exactly high-quality) is “Are you not woman enough to know?” from The Sheik. To date, I’ve seen 928 silents (features, shorts, movie previews, advertisements, and the short snippets from the early years of film). I gotsta git me some more quite filmery in 2012. Nice one Carrie-Anne. Haven’t seen The Sheik – might well have made it otherwise. PP, with the exception of Orphans of the Storm, which is decent, over-produced fluff, every film on this list is borderline essential viewing. Hope you catch some good stuff. Trick I find is to keep an eye open for screenings with live music scores – always make the film more fun, have seen at least a dozen silents that way. Enjoyed your selection, but have to disagree that City Lights had a happy ending (one of my fave films, by the way). It was painfully clear to me, and to the once-blind girl, that she could never love the tramp, or at least she could never be with him in a serious way. That was what made the scene so poignant.